More than six million migrants are waiting in countries around the Mediterranean to cross into Europe, according to a classified German government report leaked to Bild. "The biggest migration movements are still ahead: Africa's population will double in the next decades... Nigeria [will grow] to 400 million. In our digital age with the internet and mobile phones, everyone knows about our prosperity and lifestyle.... Eight to ten million migrants are still on the way." — Gerd Müller, Germany's Development Minister. The African Union-European Union (AU-EU) summit, held in in Abidjan, Côte d'Ivoire, on November 29-30, 2017, has ended in abject failure after the 55 African and 28 European leaders attending the event were unable to agree on even basic measures to prevent potentially tens of millions of African migrants from flooding Europe. Despite high expectations and grand statements, the only concrete decision to come out of Abidjan was the promise to evacuate 3,800 African migrants stranded in Libya. More than six million migrants are waiting in countries around the Mediterranean to cross into Europe, according to a classified German government report leaked to Bild. The report said that one million people are waiting in Libya; another one million are waiting in Egypt, 720,000 in Jordan, 430,000 in Algeria, 160,000 in Tunisia, and 50,000 in Morocco. More than three million others who are waiting in Turkey are currently prevented from crossing into Europe by the EU's migrant deal with Turkish President Recep Tayyip Erdogan. The former head of the British embassy in Benghazi, Joe Walker-Cousins, warned that as many as a million migrants from countries across Africa are already on the way to Libya and Europe. 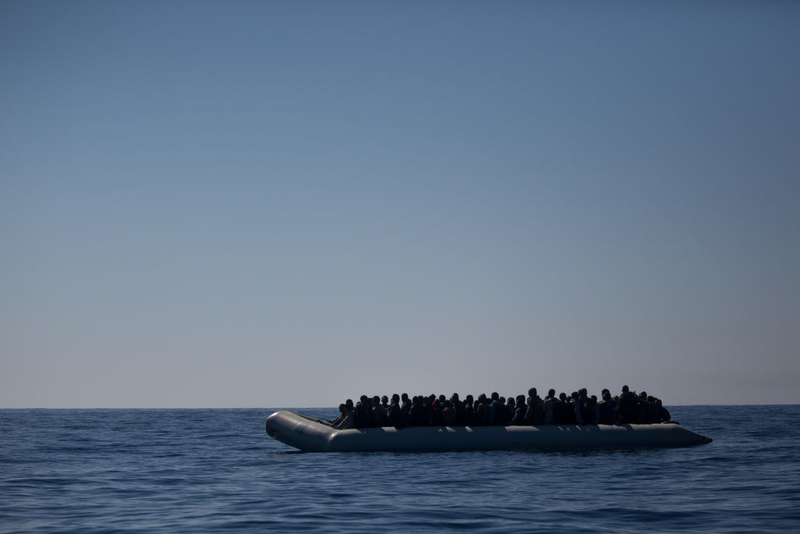 The EU's efforts to train a Libyan coast guard was "too little and too late," he said. "My informants in the area tell me there are potentially one million migrants, if not more, already coming up through the pipeline from central Africa and the Horn of Africa." The President of the European Parliament, Antonio Tajani, said that Europe is "underestimating" the scale and severity of the migration crisis and that "millions of Africans" will flood the continent in the next few years unless urgent action is taken. "Population growth, climate change, desertification, wars, famine in Somalia and Sudan. These are the factors that are forcing people to leave. "When people lose hope, they risk crossing the Sahara and the Mediterranean because it is worse to stay at home, where they run enormous risks. If we don't confront this soon, we will find ourselves with millions of people on our doorstep within five years. "Today we are trying to solve a problem of a few thousand people, but we need to have a strategy for millions of people." Just days before the AU-EU summit, Tajani called for a "Marshall Plan for Africa" — a €40 billion ($48 billion) long-term investment plan to boost education and job opportunities on the continent to dissuade people from leaving. He warned that spiraling population growth in Africa will be a demographic "bomb" that could push millions of Africans to Europe. "Without a strategy we will have terrorism, illegal immigration, instability," he said. More than half of the global population growth between now and 2050 will occur in Africa, according to a new UN report, "World Population Prospects: The 2017 Revision." Africa's population is expected to jump by 1.3 billion, from 1.2 billion in 2017 to 2.5 billion in 2050. Between 2017 and 2050, the populations of 26 African countries are projected to expand to at least double their current size. Much of Africa's population increase will occur in Nigeria, currently the world's 7th most populous country, according to the UN. By 2050, Nigeria will surpass the United States to become the world's third-largest country by population, behind India and China (the population of India is expected to surpass that of China by 2024). Beyond 2050, Africa is forecast to be the only region in the world still experiencing "substantial population growth" — the continent's share of the global population is forecast to increase from 17% in 2017 to 40% by 2100, according to the report. Africa currently is the youngest continent in the world: 60% of Africa's population is under 25, compared to 32% in North America and 27% in Europe. The EU's 28 states have a GDP of $18 trillion, nine times Africa's $2 trillion. "What we have been seeing is one of the biggest human migrations in history. And it's just going to accelerate. Young people all have cellphones and they can see what's happening in other parts of the world, and that acts as a magnet." "The biggest migration movements are still ahead: Africa's population will double in the next decades. A country like Egypt will grow to 100 million people, Nigeria to 400 million. In our digital age with the internet and mobile phones, everyone knows about our prosperity and lifestyle." Müller added that only 10% of those currently on the move have reached Europe: "Eight to ten million migrants are still on the way." "One possible reaction for Europe is to accept that migration from the rest of the world is inevitable—and embrace it wholeheartedly. Europe's debt-ridden economies need an injection of youth and dynamism. Who will staff their old-age homes and building sites if not immigrants from the rest of the world? "It may be possible for island nations surrounded by the Pacific Ocean, such as Japan or Australia, to maintain strict controls on immigration. It will be all but impossible for an EU that is part of a Eurasian landmass and is separated from Africa only by narrow stretches of the Mediterranean."